The 2018 tennis season at Norbreck Bowling and Tennis Club, officially got underway with the club’s first competition on Sunday 8th April. 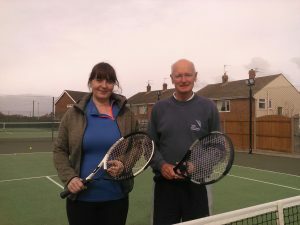 Member players paired up for this year’s first Mixed Doubles tournament to formally mark the start of the exciting season ahead. The weather was kind, staying dry and without a breeze, which made for an enjoyable afternoon for all players. Rachel Moore and Chris Whalley (pictured), were victorious as the undefeated pair throughout the afternoon’s round robin competition. Date for Your Diary… the next club Doubles Competition will be held on Sunday 6th May at 12.30pm.